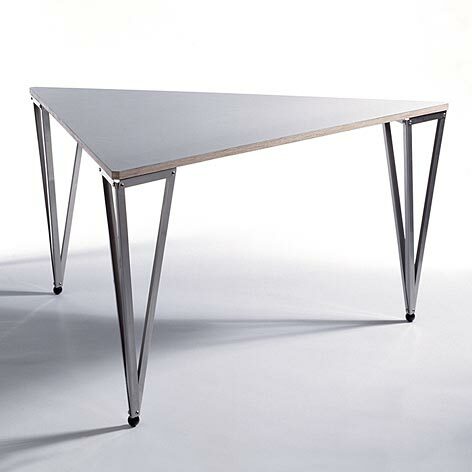 The TABLE is a lightweight table manufactured with a minimum of components. All the materials are highly durable. A strong and stable construction is obtained in an inexpensive and simple way The TABLE can be used separately or in combinations to form different shapes according to varying functions and requirements. The legs are constructed using stainless, acid-resistant steel struts assembled as tetrahedra. This geometry makes it possible to achieve a strong construction using only 1 mm steel plate. The legs are attached to the corners of a birch plywood plate cut out in the shape of a regular triangle Because the TABLE has only three legs it will always be stable. Therefore there is no need to attach stabilising screws to the legs Used in combination the tables form triangular, rhombic or hexagonal shapes, or they can be used separately as working stations, as tables to eat at, etc The shape of the plywood plate can be changed. The surface of the TABLE is equipped with a renewable PVC covering, which is easy to clean using dish washing liquid. The covering may need to be changed now and then. Dimensions: height 70 cm, width 142 cm, depth 142 cm. 3 pc eye nut M6.